While hitting the Las Vegas Strip, there’s no excuse to not go out for steaks. That’s why P.J. 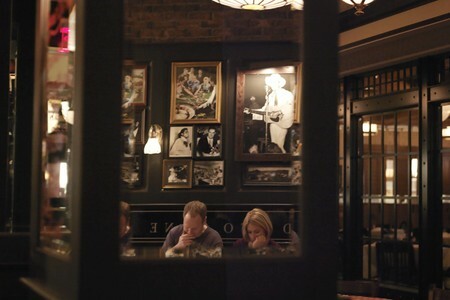 Clarke’s New York Chophouse serves up six different cuts—including its hometown’s New York Strip—to satiate guest’s appetites and fulfill their need for beef. Combine that with a classic cocktail and plate of ice cold oysters shucked fresh from the marble topped Raw Bar and your Vegas dining experience is complete. A New York institution, P.J. 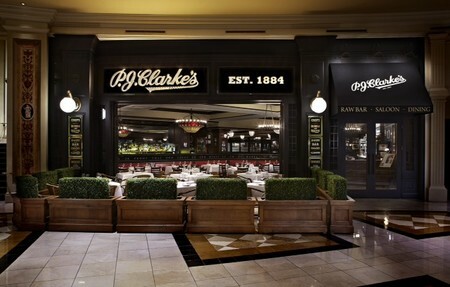 Clarke’s brings its heritage from the mean streets of New York to the sandy dunes of Las Vegas with its hardwood paneling, a century–old, hand–carved Phoenix Bar, vintage jukbox, and photos of Vegas legends adorning the walls. If Eliot Ness was searching for Al Capone in New York instead of Chicago, I would lay money on the fact that one of the first places he would have looked would have been PJ Clarke’s. First opened in 1884 as a saloon, PJ Clarke’s has very carefully established itself as an American institution by offering nothing but top quality with an eye on keeping the class of yesteryear alive. Since first opening the doors in its iconic brick location in NYC, they have expanded to five more eating and drinking establishments around the states (and internationally, including one in Brazil!). On a balmy Las Vegas afternoon, we walk off the sidewalk of the Strip and in to an entirely different world. 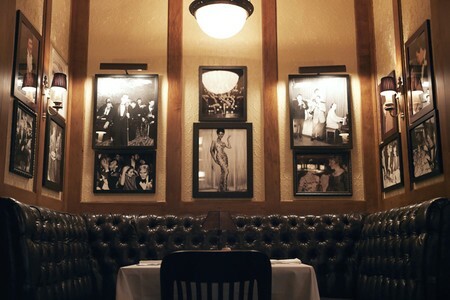 Though just down the road from the stately Bellagio and nestled into the Forum Shops at Caesar’s Palace, the PJ Clarke’s in Vegas has done its utmost to keep in tune with the original, from bringing in old world chandeliers to importing the super rare marble oyster bar straight from Italy. Walking through the doors instantly transports one back to the beginning of the century. PJ’s has a jazzy feeling to it. A classy yet casual vibe where one can just as easily get a steak as they can one of PJ Clarke’s famous burgers. It runs the gamut of quality American cuisine, including an impeccably fresh oyster bar, chops, and Maine lobster, to just name a few. The dark wood adorning the restaurant along with the familiar clinking of glassware immediately put me at ease, as does Matt, our waiter. Much like the restaurant itself, he is affable and professional at the same time. As is my custom when dining in new establishments, I tell Matt to go to town on the menu. After making sure we aren’t allergic to anything, he gets drink requests from my companion and me and cheerfully leaves to place the order. Cocktails, to me, are the telltale sign of a restaurant. 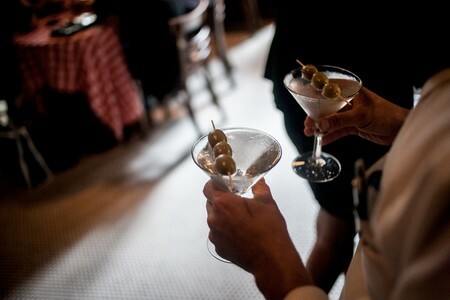 If the signature drinks are delicious, the chance of getting a quality meal is exponentially high. With my typical skepticism in mind, I order the Sister Mary Walks Funny- an anejo tequila drink with elderflower liquor, cucumber, cilantro, lime, sugar, and Grand Marnier. My date opts for the Bloody Bloody Mary. I guess we were in a Mary kind of mood. Our drinks arrive and before I even try mine, my attention is drawn to the assortment of pickled vegetables adorning my date’s Bloody Mary. It is a hearty take on the classic concoction with the right amount of zesty spice, and aside from the traditional celery, the bar tender has added pickled carrot, onion, lemon, lime and garlic. The pickled veggies are wonderful, but the real kicker is the whole jumbo shrimp hanging off the side of the glass. I distract my date and immediately steal it. My cocktail is quite the opposite- light, refreshing, and considering the sweetness of the liquors involved, it is well balanced and thought out. To start the feast, Matt brings us a sampling of their famous oyster bar, three different styles from Massachusetts, British Columbia, and the California coast. All three have distinct flavor and texture, and we are impressed with crisp fresh taste. 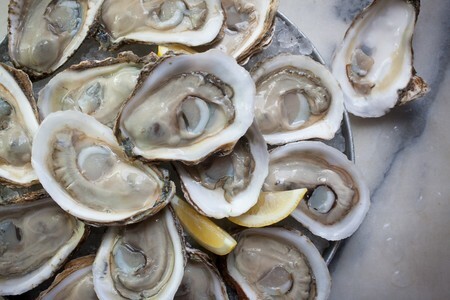 I jokingly ask Matt how they get their oysters to taste so fresh when they are in the middle of the desert, and he tells me matter-of-factly that they have them flown in fresh every morning. Oh. That settles that! After a few oysters, Chef Johnny Church joins us. He tells us that he wants to do a kind of sample menu for us, and asks if it would be alright. Judging by our drinks and oysters so far, we tell him to get crazy. After a few minutes, we are brought Tuna Tartare Tacos, small bite-sized tacos, with chive, lemon, avocado, olive oil, lettuce, and a “crème fresh” sauce lightly drizzled over top. The combination of the crunch from the shell with texture of the fish is delightful, and the crème fraiche complements the tartness of the lemon juice perfectly. Along with the tacos, Matt brings us Crisp Parmesan Tater Tots. I am expecting there to be shaved parmesan on some regular ol’ tots, but one bite in, and I am almost brought to tears. The parmesan is inside the fried potato nugget! I immediately tell my date to stay away, warning her of dire consequences, should she touch any of these golden spuds. The General Manager, Jason Villafana, swings by our table to make sure everything is up to standard. We begin raving about the tater tots, and he tells us PJ Clarke’s sells around 1,500 a day, and that they are all hand rolled. “By one guy?” I ask. “Yep,” he replies, “That is one guy’s job.” I tell him I never would have expected to eat at a restaurant with an Executive Tot Maker. He laughs and says, “For that, I’m going to give him a raise!” The tots also come with a smoky tomato jam that, according to my date who hates ketchup, is “to die for.” I prefer my tots naked, but to each their own. We continue on the appetizer train with a small cup of Tomato Soup with Cheddar Toast. The soup is really, really tasty and somehow manages to be creamy without being heavy. The cheddar toast is crispy and delicious as well. Next up, Matt brings us Duck Confit Spring Rolls. They have jicama, cilantro, cherry peppers and greens in them. On the side is a sweet chili sauce that Matt refers to as “Our version of sweet and sour.” Whatever he wants to call it, I call it ridiculously awesome. There are tiny hints of citrus in the sauce, and I forget to ask Matt if it’s mango or not. I’m thinking it is, and I’m going to have to ask him next time I go back. The cilantro adds a great complementary flavor to the duck, and the cherry peppers have surprising bite and spice. With the rolls, he also sets down two of their Maryland Jumbo Lump Crab Cakes with a parsley oil tartar sauce. The panko breading is light, and the crab meat itself is plump and flavorful. I foolishly ask Matt if the crab meat is real or imitation, and he gives me a very sympathetic look and tells me it’s real. Of course. For the culinary coup de grace, Chef Johnny has gone with a PJ’s classic- the famous “Cadillac” PJ Clarke’s hamburger, named so by none other than Nat King Cole. We had been informed earlier by Jason, the GM, that they had recently been voted The Best Burger in Vegas, so obviously our expectations are high for the main event. PJ Clarke’s once again rises to the occasion- a thick slice of American cheese tops the huge (and I do mean huge!) patty. The flaky, buttery, and lightly toasted brioche bun could be eaten alone, but why would anyone ever deprive themselves of this delicious burger/cheese/bun combination? 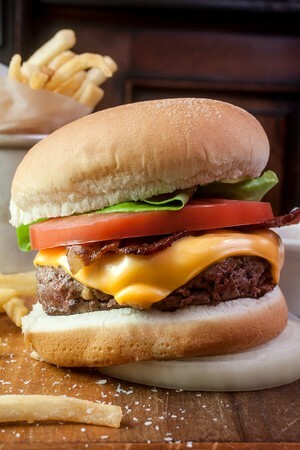 The classic lettuce, tomato, and onion accoutrements are on the side, but I dive in to the burger straight, not wanting to be distracted by the beguiling giant, juicy tomato or the crispy fresh lettuce. Now, I’ve had a cheeseburger or two in my time. I even have a few secret recipes of my own up my sleeve. When it comes to grilled ground beef, I consider myself somewhat of a connoisseur, but in a world of delicious meat sandwiches, PJ Clarke’s Cadillac reigns supreme. The flavors and juice the chef coaxes out of the meat is second to none, and the tasty sweet potato fries are crisped perfectly and are a great complement to the massive burger. To finish of our lavish lunch, we are brought both Bread Pudding and a Chocolate Crème Brûlée. Matt (who I am increasingly beginning to think is some kind of gastronomic wizard) tells us the ice cream used in the Bread Pudding was made by the best, most sought after creamery in Vegas. I tell him, “Of course it is.” The cream sauce has a heavy note of whiskey in it, with elements of cinnamon and chocolate. Matt the Wizard asks us if we can identify the fruit in the breading. I take a stab at it with cranberries, but he shakes his head and says cherries. I let Matt down again. The Chocolate Crème Brûlée has a sprinkling of sea salt over it with a caramel whip. The combination of salt and chocolate is magnificent, and the consistency of the dish is exactly how a crème brûlée should be. It is so good, I forget my manners and whip out my phone to send a photo of it to my father back home. I do however, stop short of licking the bowl clean. At the end of our meal, my date remarks on how she was blown away by what she expected to be a lunch resembling a more typical pub-style meal. I hadn’t thought of it that way, but there is definitely a notable distinction between pub perception and the culinary actuality of PJ Clarke’s cuisine. We bid a hearty farewell to Matt, Jason and the rest of the staff, and step out from the classy old world charm of the American institution and in to the bustling streets of America’s playground. Insider Tip- Have a large party? Reserve the Sidecar room at PJ Clarke’s. So much more than a private dining area, the Sidecar has its own bar, kitchen, staff, etc. Still exuding the class and charm of the larger establishment it resides in, the Sidecar room is basically a restaurant within a restaurant. Oh, and tip #2… Matt. A wizard. Seriously. Hi could you tell me if you could serve a party of 14? Yes, P.J Clarke's can serve "plated" dinner parties from 1 guest to 120 guests. The 5 of us enjoyed PJ's very much, nothing we ordered was bad..... in fact PRETTY GOOD.....We would go again! Everyone knows Vegas has every level of Restaurant excellence. My task was to book a Restaurant for 8 people,2 couples within that group with Anniversarys. No one in our group had ever been there so talk about pressure. P.J. Clarke's made the evening even more important then the event.The food,the atmosphere and most important the staff not only made me look good but everyone said it will be their choice in the future. Many thanks to them. As a group of eleven in town for business, we celebrated a co-workers birthday at the Terry Fator show. I wanted a nice, convenient location that could accommodate us following the show and PJ Clarke's exceeded my greatest expectations. 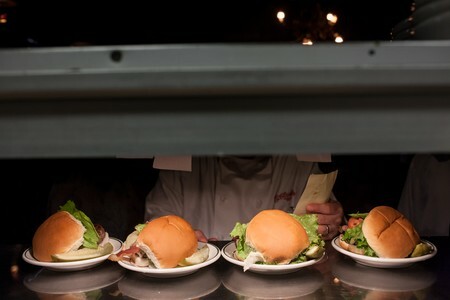 The service was impeccable; the menu offered a great variety; the food was delicious and the ambiance was the perfect. My fat, juicy filet was prepared perfectly. The staff treated us like royalty. I'll definitely dine at PJ Clarke's again and recommend it to colleagues. Best Hidden Restaurant in Vegas!!! Everything lived up to their great reviews.. Loved everything about this restaurant and will definitely return!!! Steak and oysters were incredible!!! Good service, good food, good portions, good price. Awesome food, fabulous staff...you can't go wrong!!! Loved everything about this restaurant, the servers, the food, would go back in heat beet. I think it was better than " prime" we had a great time. We had a large group of 10 and the waiter was so much fun. Look it up if you are in Vegas! Great dinner and service. A bit hard to find, but we had a great time. All the dinners were great and the shrimp and oysters were real fresh. We were late arriving at the restaurant and it probably was the busiest time of the day for dinner when we were there. Atmosphier of the restaurant was classy and very nice, just one thing, it was very noisy. Wish they had a separate area where bit more quiet. If you are going there to have some drinks and good food with your friends as very casual meeting, this is a great place to go. Unfortunately I don't recommend for romantic quiet dinner though....food was great by the way. Waiter was extremely friendly & timely. Food was really good. Portions big enough to share. Highly recommend. The ideal spot for a cozy dinner for two with the $99 special. The steak was great but could have been cooked a tad longer. A full bottle of wine (we chose Malbec) was included and was great as well. Plenty of time to enjoy the food and relax and talk. Great staff!!! Two of us ate at the bar and the service was very good. The food (and selection) was excellent! Good Food, but at a Price! Food was prepared and presented as promised. Sides were a surprise as they easily fed two. Had this been explained we would have modified our order. We dined on the outside area, and felt that we were in a typical mall restaurant. Good value for food vs price. Lobster great-steak good when cooked correctly. Although we were seated immediately, we soon found out why. The wait for our server to bring our drinks from the bar was quite long, which was surprising considering there were not many customers in the restaurant. Once we received our drinks, one of them was horrible and had to be sent back to be remade. Our food was mediocre at best. Two of us ordered the Halibut. Both were extremely small portions, which turned out to be a blessing since they were tasteless. Mine was extremely dry. I would not return to this restaurant for any price. Given the prices and reviews I expected a much better overall dining experience. Our meal was bland, very little taste, and overcooked. Portions were small. We had Christmas dinner at PJ Clark's in Las Vegas. We ordered the Prime Rib which was one of their specials of the day. The meat was tough and had very little flavor. In fact I got sick later that evening and i believe it was due to the meal at PJ Clarke's. I would not reccommend this restaurant. The service we recieved was the only bright spot server was very good. Poor quality food. Inexperienced wait staff. Small quantities in side dishes. Extremely poor quality steaks. Limited drink menu. 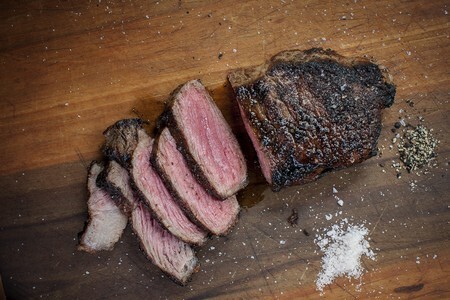 Your could throw darts at all the steak houses in Las Vegas and pick a better one.